Today I’m back with another history curriculum review. So far we’ve looked at Veritas Press History, Story of the World, and Mystery of History. In this review, I’ll examine Classical Conversations history. I have been receiving Classical Conversations catalogs in the mail for some time now. (If you homeschool or would like to, I’d strongly encourage you to sign up for as many free curriculum catalogs as you can find. The ones I currently get are Veritas Press, Memoria Press–which is a catalog/free magazine, , and Classical Academic Press. I also look at Logos Press online catalog. This will allow you to compare and contrast curricula choices.) Last summer, I had the opportunity to attend a Classical Conversations informational demo day. I was already familiar with what they had to offer through the catalog, but during the demo day I got to look through everything and see it put into action. 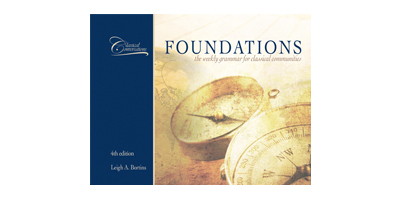 Here’s my caveat for this review: I’m only going to talk about the two history components of Classical Conversations today, and I’m going to restrict it to the “Foundations” (K4-6th) level. 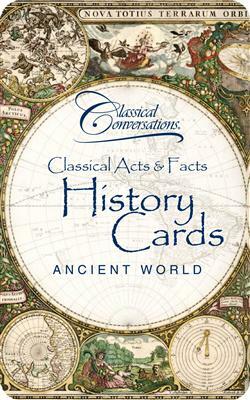 Classical Conversations history component is taught in two parts, the timeline song and the “history sentence.” For the timeline song, Classical Conversations (CC from now on) offers Classical Acts and Fact History Cards in four packs (Ancient World, Medieval World, New World, Modern World) with 161 cards total (so, close to the same number as the Veritas cards). These cards are made of a sturdy cardstock with a laminated coating, so they hold up well and are wipeable. CC used to use Veritas Press timeline cards, so you may see those around in the CC community as well, but they’ve come out with their own cards recently that include some different events/people and more non-Western history than Veritas. However, unlike Veritas’s design of learning one set of cards per year, these cards are designed for all 161 card events/people to be learned in one year and then repeated every year. Also for the timeline song, CC offers a CD with their own original song to go with the cards (the CD includes much more than the timeline song–see below), or just the timeline song can be purchased in a series of mp3 downloads on the CC website. Many (probably most) CC families and communities (CC exists as a co-op set-up, but their products are available to anyone) also use hand motions with the song. These vary from group to group and family to family, but a bunch of variations are available to view on YouTube. Before I move on, I just want to mention that CC also has a geography curriculum that goes along with their history, and I really like the CC approach to K-6th geography! The geography lessons are found in the Foundations Guide, and they also offer some other geography resources. But Leigh Bortins, the founder of CC, takes a very basic approach to geography in her book The Core, and that’s what we’re currently doing. I believe that memory work is vital to the education of young children, when they can memorize so easily and soak it all in! CC is great on this concept, providing lots of memory pegs. It includes important events in both Western history as well as non-Western history, which the Veritas cards lack. There wasn’t enough church history integration for me to be satisfied with it as is. It really needs a core curriculum to go along with it. In my opinion, just what CC offers isn’t enough. Many CC families that I’ve talked to supplement with Story of the World or Mystery of History. Some families supplement with living books also. The history sentences use a three-year history cycle, which I think perhaps crams too much into three years, skipping over some major events. I personally much prefer at least a four-year cycle. Furthermore, the cycles are not chronological (though the timeline song, of course, is). The cards are fairly pricey for what you’re buying, and the history sentences are found in the Foundations book, which is very expensive! The cards don’t follow the Answers in Genesis/Ussher young earth timeline; I did have to rearrange some of the cards–so that’s an issue for those of you following a very young earth timeline for the ancient time period. First of all, I’ll comment on why we’re not part of a CC co-op. We have one that meets in a church that’s less than a minute from our house, which is where I attended the demo day. I think it’s a great concept for the K4-6th grades. I’ve read the founder’s book, as I mentioned above. I like a lot of what she has to say, and I like a lot about what CC does each week. At the end of the demo day I attended, I spent some time talking to the director of our local program. At some point in the conversation, I guess she discerned that I was familiar with Classical Christian education and asked me whether I would be willing to be one of the teachers for the upcoming year. (Students are divided into small groups for part of the time, and each group has a teacher, or tutor.) I will say at the outset that CC is expensive to enroll in (not like a school, of course, but still), plus you are strongly encouraged to buy the materials for your home as well. Being one of the tutors would have just barely defrayed that cost for me with two children enrolled (i.e., I would have been doing all the work for my own children plus other people’s children without adding to our family income). So, the expense was an issue. But, despite the many things I really liked about CC, Scott and I decided against enrolling in CC Foundations for two main reasons. First, we were not comfortable with the music. CC uses music for almost everything. (It’s basically several hours of memory work set to music with an art or music lesson as well and a science experiment at the end.) The music they chose for this lifelong memory method just wasn’t something I wanted my children to learn. I really wish they had chosen something more classy and “classical” (not necessarily classical music, but something time-proven and beautiful) for Classical Conversations! Second, I was uncomfortable with the tutor “vetting” process. This may differ from location to location, but it seemed to me like any interested mom could tutor if a spot was available. (There is a day-long training session, but they asked me to tutor after only knowing me for a few minutes, and no question was asked about my religious beliefs, etc.) Maybe I’m a control-freak, but that made me uncomfortable about who would be teaching my children. Parents are encouraged (required, even, I believe) to stay, though; it’s not a drop-off situation, so that does defray some of that concern. Now, here’s how we use CC history in our home. I purchased the timeline cards (with 40% off coupons at Mardel) and I mixed them in with our Veritas timeline cards (which I got on craigslist). I don’t use all the cards in either set. I chose the ones I wanted my kids to memorize. (There was some overlap also.) We could have done our timeline song without any cards. That’s definitely doable for those who don’t want to make the purchase. However, both sets of cards have a nice piece of art on the front, which I thought would be a helpful visual memory peg for my kids (that’s what the picture is there for), and both sets have a few key facts on the back, which is handy. I put the cards in these binders with these plastic sleeves (both which I discovered at the CC demo day and which perfectly hold the Veritas and CC cards), and we flip through them every day that we sing our timeline song. Using the binders and sleeves will, I hope, make them last for years to come! 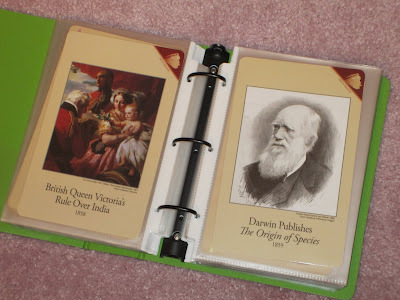 (I have one binder for the ancients through the middle ages and another binder for the reformation through the present day.) We don’t use the history sentences at all. I will be sharing the words and tune, as well as the motions, to our family’s timeline song in another post coming up soon! I’ll also share a post that lists all the events on both the CC timeline cards as well as the Veritas cards so you can pick and choose for yourself what you’d like your kids to learn. Non-homeschooling families can learn a timeline song just as easily as homeschooling families. It only takes a couple minutes a day, and in no time, your kids (and you!) will have memorized a basic skeleton for what has happened and when it happened throughout the history of the world. If your kids are not learning a history timeline in school, I’d strongly encourage you to reap the benefits of doing this. In fact, many of CC’s ideas for various subjects would be a simple way to give your kids some of the benefits of classical education if they’re not already getting one. Thank you for the review. I am considering CC and teach my children from a young earth perspective. Would you mind giving me more detail about what you had to rearrange in the timeline. I have been concerned with the tutoring approach but one CC director explained to me that the tutors are expected to introduce the memory work and model a love of learning in the presence of both students and parents. Hi, I found your review informative, however as a member of CC I also find it misleading. You cannot review CC by just looking at their catalog or even attending one information meeting. CC is unlike any of the other programs you mentioned even if they call themselves “classical”. It seems “not enough” to families with a “traditional” school mentality (we all have it). True Classical Education based on the Trivium takes some time to grasp for most families. The many blogs out there that offer the “extras” are also misleading. It isn’t needed. The goal of Foundations is to hammer in the “pegs” of knowledge for later learning which is intended to be the Challenge years. Perhaps sitting down with someone to see the vision cast from Foundations through Essentials into Challenge would offer a clear understanding for families interested in checking CC out. CC offers more than just the subject “pegs” it models for parents how to educate their children. It teaches the children how to “train the brain to retain”. It also exposes them to public speaking in front of peers rather than just mom and dad. It teaches them to ask questions and debate. Its ok that not all families find it a fit. There are so many great programs out there. It just seems that most people don’t really understand the program. Thanks for your input! I love hearing from parents involved with each of these programs. I really like Classical Conversations and very much considered becoming part of a community. There were several reasons we decided it wasn’t a good fit for our family, which I mentioned in this review. However, as to it not being “enough”…a few points I’d like to make to clarify. First, I have talked with several families who have left excellent classical Christian schools to homeschool and have joined CC only to find it not challenging at all for their kids in the upper grades. That said, I realize that CC is not supposed to be the only thing that these kids are doing. That’s not really the reason we chose to not be part of a CC community, so I apologize if I was misleading in any way on that! Second, while I appreciate the Trivium pedagogical method, as it can be REALLY helpful for parents, that can’t define true classical education. I’ll be doing a series on here probably this winter on the four predominant evangelical methods of classical Christian education. Classical ed based on the Trivium (Trivium pedagogy and the three stages of child-development) is only one method. It is certainly the simplest method of the four, but I would argue that being the simplest has both pros and cons. The other three predominant methods of classical Christian ed are definitely more challenging/rigorous–not that everything these other three methods propose is necessary, but I do think some of it is. So, I’m not really comparing CC here to traditional education so much as I’m comparing it to the other three methods of classical Christian education (and I’m also comparing it to other Trivium-based classical ed programs/pedagogies such as Veritas and The Well-Trained Mind). However, that said, anyone involved in ANY of the four methods of classical Christian ed is getting a MUCH better education (in my opinion) than someone following a traditional pedagogy. As you said, there are so many great programs out there these days to help parents give their kids a great classical education, and CC is certainly one of them! Do you have your children memorize the dates on the front of the timeline cards? Nico, no, not nearly all of them. I have them memorize important dates for history, literature, or the Bible–Judah falls to Babylon 586 B.C., death of Julius Caesar 44 B.C., Jerusalem destroyed 70 A.D., Battle of Hastings 1066, Magna Carta 1215, Martin Luther’s Theses 1517, Mayflower 1620, etc.–and dates of eras, like, The Middle Ages 450-1500. I think too many dates would just be confusing and overwhelming, but I try to have them learn enough dates that they can have an idea of what important was happening in each century. You can see all the dates I have them memorize in my timeline song here. This was very helpful. I’ve ordered a couple of binders and some sheet protectors. My daughter has completed Bookshark ancient history 1 & 2. I will now have a child in grade 3 and K so I’m looking to change course so they can work together. I love the concept of a timeline song and a Christian worldview. Your reviews have been very helpful. Thank you. Hello and thank you for a great review! 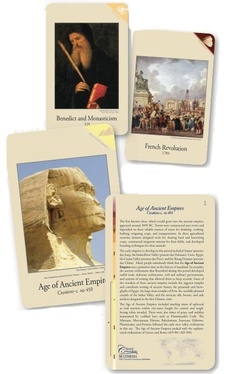 I am not part of CC but have purchased the timeline cards as a resource for teaching history. I am struggling with your statement that they do not follow the Answer in Genesis Young earth dates….I did a very cursory run through of some of the AIG timelines and found very little difference (a matter of between 30-50 years). In fact, in the instance of a few instances; such as Israel’s fall to assyria, are the exact same date: 722 BC. And John the Baptist’s birth is set at 5 BC. Is the debate over just a few years of difference? I am truly trying to understand as a homeschool mama trying to do the best by my kiddos…and I believe strongly in the literal 6 day creation/young earth theology ;) Thank you!!! I found this review quite funny. We do attend CC, and it has been a great fit for our family. What I found funny was the comments on the tune used for the Timeline song. They vary the song because of the length, and it makes it easier to remember different parts of the song if it sounds different. I found it funny that you thought it was beaty and cheesy. You were critical of the tune, but when you made up your own, you used the tune of “The Three Little Indians” for the whole song! LOL! You said you were concerned about this being a life long song in your children’s minds. I’ll take the CC tune over yours any day. It makes me sad when people knock down programs that they haven’t even been a part of. Classical Conversations is a very well organized Christian based program to help homeschool moms. For $99 you can get the teachers manual, and that covers 3 years of the Foundations program. For people who think it’s expensive I think you need to re-evaluate that. You don’t have to buy the extras. I paid $185 to register, and $335 for the year. Sorry, I don’t think that is expensive. There was also a separate fee to cover the rent of the building we were in that cost $50 for the year. The $185 goes to corporate, and the rest of the tuition stays at the campus to pay tutor fees. I would be more helpful if you stuck to reviews of things you’ve personally used for a long period of time. Everybody has their favorite curriculum, but I don’t think we always need to nitpick ESPECIALLY if we haven’t used it.